Motivado por la gigantesca decepción que fue el final de "How I Met Your Mother", se me ocurrió hacer una lista de Series que me gustaron de principio a fin y que el final fue algo digno de ver. 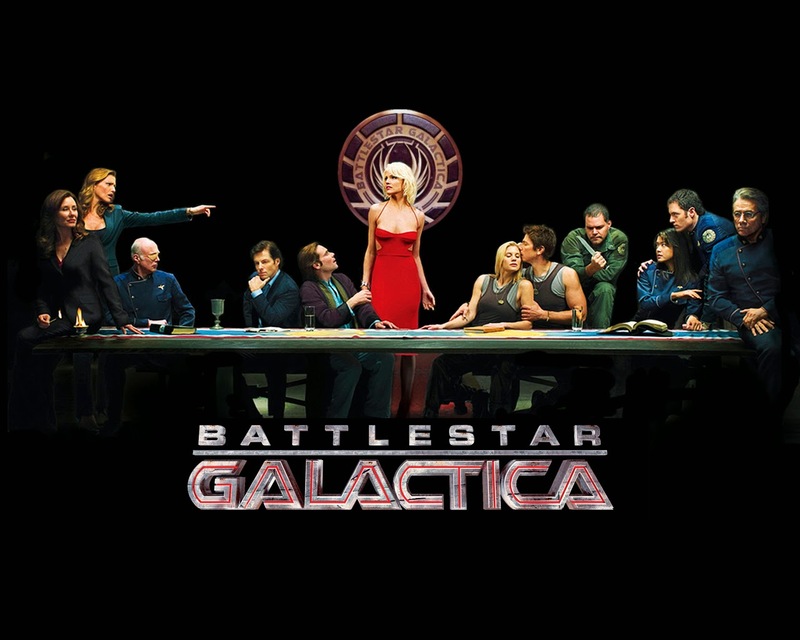 Galactica no solo me parece el mejor final que vi, sino la mejor serie de todas POR LEJOS! 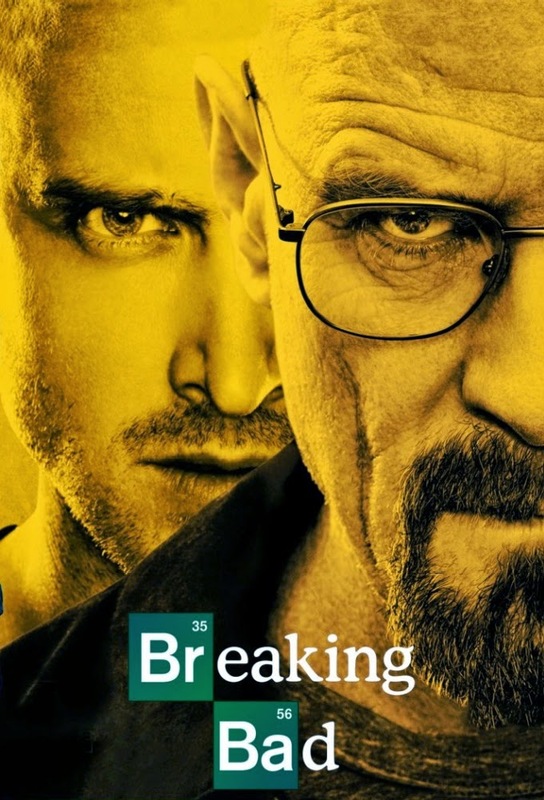 Ya la vi varias veces y el progreso de todas las temporadas y la culminación en el episodio final es lo mejor que hay para mi. Creo que no debe haber nadie que no haya escuchado de lo gloriosa que fue esta serie, y viendo la forma en que fueron evolucionando los personajes en cada temporada, y los caminos que toma la historia, es algo que da gusto de ver lo bien pensado que esta. 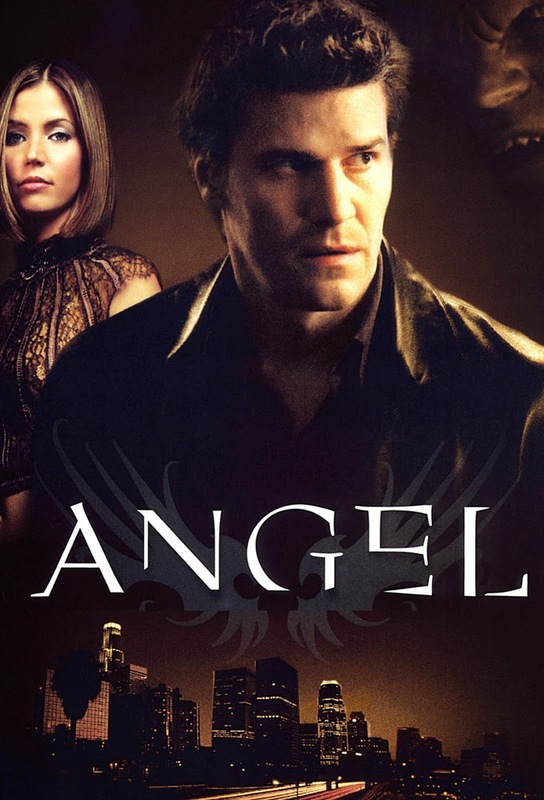 Esta serie también me gusto muchísimo, y aunque empieza con temas bastante genéricos, en cuanto presentan la historia central de la serie todo se va volviendo cada vez mas atrapante, y disfrute todos los capítulos de principio a fin de la serie. 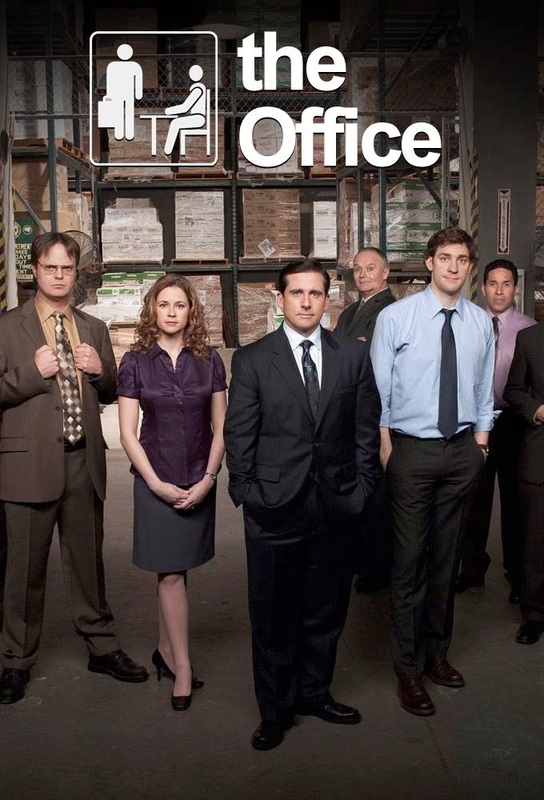 Los primeros capítulos de esta serie te pueden producir hasta vergüenza ajena al verlos, el personaje de Michael te pone incomodo como espectador, pero la verdad que después es tremendo como todas las historias y los personajes te terminan comprando, y si bien en una de las ultimas temporadas paso algo que me pareció que iba a arruinar la serie, supieron manejarlo, y el final fue realmente genial. Esta serie empieza con capítulos entretenidos, pero un tanto "pasajeros", podría decirse, te parece estar viendo una seria que esta buena, pero es una serie mas para pasar el rato, y en un punto hace un giro que la historia se vuelve realmente atrapante, y te quedas esperando capitulo tras capitulo para ver como se van a resolver determinadas situaciones, y el final me sorprendió en muchos aspectos. Esta serie me gusto mucho, porque supo tener drama, aventura, comedia, todo! Y para describir el final solo se me viene a la mente la palabra "epico", que es el unico final posible que podrias esperar de esta serie. 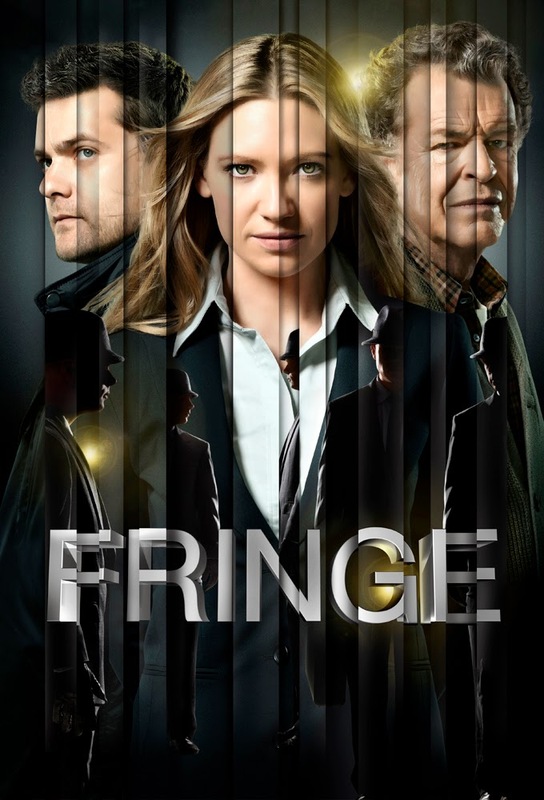 Si bien la serie es excelente de principio a fin, y el ultimo episodio es el final que se merece una serie así, después salieron una serie de comics por quienes quieran seguir explorando que sucedió con los personajes después, etc. equipo, ver las tareas necesarias y quien quiere tomarlas, etc, etc. ES TU OPORTUNIDAD!! (promoción no valida para ningún ser vivo). OK, I have a long list of news, topics, ideas and developments I want to share with you, but we have to begin with one of them, and the chosen one is Slideviewer. The first thing to notice is that none of the intermediate tables are created nor their indexes, but also all the _pkey indexes are missing. What I did in my previous post was to say that I couldn't update because the intermediate tables were missing. That was actually my fault. I didn't read carefully osm2psql's manpage, so it happens that the --drop option is not for dropping the tables before importing but for dropping the intermediate after import. This time you'll probably notice a difference: there's this new contours table with a couple of indexes. This table contains data that I'll be using for drawing hypsometric lines (also know as contour lines) in my map. This 21GiB table contains all the data from 0 to 4000+m in 50m increments for the whole Europe and some parts of Africa and Asia, except for that above 60°, which means that Iceland, most of Scandinavia and the North of Russia is out. At that size, I think it's a bargain. As with jburgess' data, we have the intermediate data, and quite a lot. Besides the 21GiB extra for contours, we have notably 42+52+2+7GiB for ways. In practice this means that, besides of some of my files, OSM+contour data uses almost all the 220GiB of SSD space, so I'll just move all my stuff out of the SSD :( Another alternative would be to just reimport the whole data from time to time (once a month or each time I update my rendering rules, which I plan to do based on openstreetmap-carto's releases, but not on each one of them). Here you can see 4 lines, 2 for the sum of postgres and two for osm2psql. The thick lines graph the RSS for them, which is the resident, real RAM usage of that process. The correspondent thin line shows the VIRT size, which is the amount of memory malloc()'ed by the processes. As with any memory analysis under Linux, we have the problem that all the processes report also the memory used by the libraries used by them, and if there are common libraries among them, they will be reported several times. Still, for the amounts of memory we're talking about here, we can say it's negligible against the memory used by the data. In the graph we can clearly see the three phases of the import: first filling up the intermediate tables, then the real data tables themselves, then the indexing. The weird curve we can see in the middle phase for osm2psql can be due to unused memory being swapped out. Unluckily I didn't log the memory/swap usage to support this theory, so I'll have it in account for the next run, if there is one. In any case, the peak at the end of the second phase seems to also support the idea. One thing that surprises me is the real amount of memory used by osm2psql. I told him to use 2GiB for cache, but at its peak, it uses 3 times that amount, and all the time it has another 2GiB requested to the kernel. The middle phase is also hard on postgres, but it doesn't take that much during indexing; luckily, at that moment osm2psql has released everything, so most of the RAM is used as kernel cache. 13 paragraphs later, I finally write about the reason of this post, updating the database with daily diffs. As I already mentioned, the data as imported almost took all the space available, so I was very sensitive about the amount of space used by them. But first to the sizes and times. This time is in the order of minutes instead of hours, but still, ~30m for only 25MiB seems a little bit too much. If I process the diff files daily, it would take ~15h a month to do it, but spread in ~30m stretches on each day. Also, that particular file was one of the smallest I have (between Mar03 and Mar17); most of the rest are above 30MiB, up to 38MiB for Mar15 and 17 each. Given the space problems that this causes, I might as well import before each rerender. Another thing to note is that the cache is quite useless, falling from ~20% to ~5% hit rate. I could try with lower caches too. The processing speeds are awfully smaller than at import time, but the small amount of data is the prevailing here. 3MiB more of points, 21+5+1MiB more of rels, 45+1MiB more of roads, 0+2+8MiB more of lines, 0+3MiB for polygons, 0+4+4MiB for ways. In total, some 97MiB more. I tried a VACUUM at the end, but no space was gained, and I don't have enough space for VACUUM FULL. As VACUUM does not defragment, a second and third updates should make use of the internal fragmentation. Let's see. The table sizes keep growing, as expected: OSM data does nothing but grow; my free space does nothing but shrink, currently at mere 249MiB. Given that the intermediate tables are dropped at the end of the second import phase, it only makes sense to do full imports from time to time, before updating the rendering rules. Munitely is not for me. The information that a website or application can exhibit to an user can be organised in different ways. A user navigates looking for information with a specific objective. The easier and faster he finds the information, the greater the satisfaction and productivity will be. For this reason is that we should facilitate tools that aid the user to achieve his goals. Navigation menus is one of the tools that facilitates the user to navigate inside the information architecture of website using dialog boxes, "boxes" (can be of any shape), images or even also simply text. Lets illustrate an hypothetical situation where a customer wants a to buy a product from a company A. This company has one of the best products in the market. Their website contains lot of information regarding the products offered and the company itself but the data is unstructured and it is presented into single page. On the other side of the river, the competence B, has a well organised site with a simple top menu for navigating the information concentrating the main services, products and company information. This menu helps the user to access directly the information with a single click. So, the customer visits A's website looking for a product but disoriented with such a huge amount of information and unnatural navigation style; he finally desists. Next, the customer go to the competence's website and with just a couple of clicks using the top menu, he finds and buys the desired product. Most of the time, users are not patient and in fact, they lose it really easily. Currently, there are lot of websites that despite of having menus still have navigation problems. Moreover, having a good navigation design is not an easy task and should be tackled properly. Three distinct goals must be obtained to have a pretty decent navigation. Provide means to go from a place to another without overcomplicating the connections. Communicate the relationship between the elements it contains. Communicate the relationship between its contents and the page the user is currently viewing. There are different types of navigation designs with different characteristics. This type of navigation design provides access to the main areas or key points of a site. Every place where the user wants to go, eventually, will arrive there. In this kind of navigation design, the user moves through the parent, siblings and children. Moreover, this style provides access to nearby elements in the architecture. This navigation design provides shortcuts to different parts of the architecture that are not easily reachable by global navigation or local navigation but at the same time maintaining a hierarchical structure. Sometimes while navigating content, the user need extra information. Instead of scanning through the content or outside the site, it adds hyperlinks embedded to the extra data. Not understanding the user needs and using this type of navigation design can lead to confusion. It's useful to provide elements that are not needed on a regular basis but they are provided because of convenience. Typical examples are feedback forms, contact information and policies and principles. In this design, the navigational device is not embedded in the structure and it's independent from the content or the functionality. 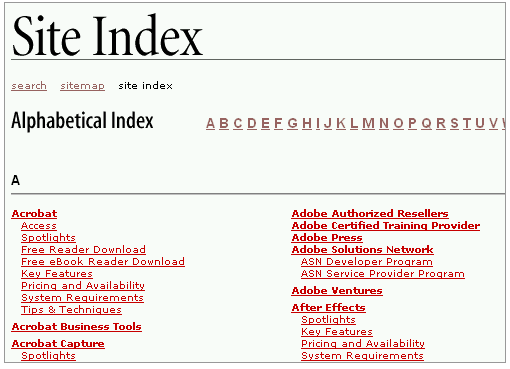 For instance, site maps and index (also called "web site A-Z indexes") are clear examples of this type. When a user can't find what he wants using the other kind of navigational styles he lean toward to this type. The site map is a outline of the architecture of the site with links in a hierarchical order. Site maps usually provide two levels of depth at maximum. The most common way of generating index navigation is with a list of links of important elements alphabetically ordered. These are all the elements that forms the interaction context and how they are placed into a window or page. The layout defines the size, spacing, emphasis the GUI elements and location of the elements. Good layouts helps users to find what they are looking without forgetting the visual appearance. Nowadays is a highly searched characteristic in the market for products of any kind. Google's Play Store and Apple's App Store have basic guidelines that each app can follow concerning design, screens layout and also internal programming structures and details. Sometimes the process starts drawing the layout in paper with the elements placed to see how well they suit. 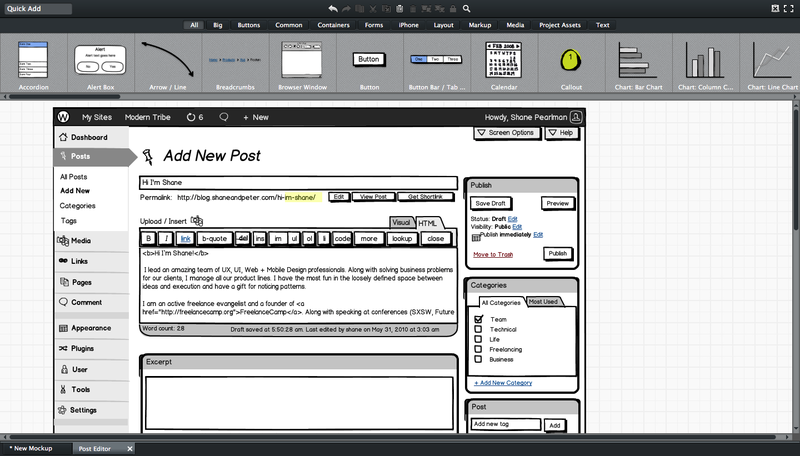 There are also tools like inVision and balsamiq which facilitates designing layout prototypes with predefined drag-and-drop elements. Although how we access the information is important also it is how the user consume it. Users unconsciously use different patterns while reading the content of a website depending if attracts or repulses the attention. At the top area of the sites, users read in an horizontal movement. After that, users read a little more in the content of the page going down and the start reading horizontally again. Lastly, users scan what is left of content in a vertical movement. 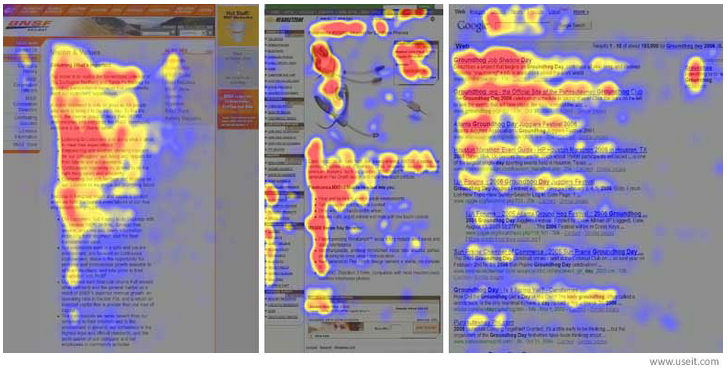 Using heatmaps for tracking eye movements he distinguishes an F pattern. In this pattern, the user scans the page starting in the upper left corner and ends in the lower right. 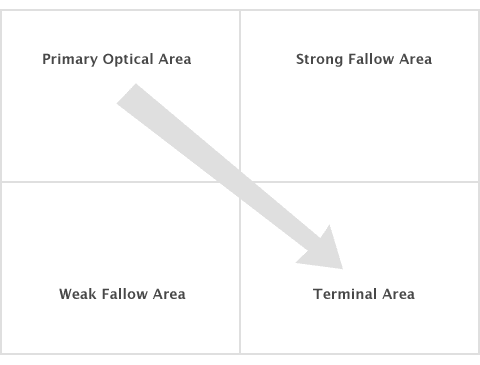 The upper right corner, strong fallow area, sometimes is being notice and the lower left corner is called weak fallow area. This way of scanning path is also known as Guttenberg Path. In devices where the screen size is limited like smartphones and some tables, the scanning pattern is different. The path starts in the upper left corner and goes down until the end of the screen following a straight line. Once the device is turned right, the screen width is expanded and the pattern converts to something similar to the reading pattern. "Monologue conversations" explain to the user everything. They answer every question that he could have without involving the user. Sometimes it is a good approach but the user doesn't have a voice in deciding what to read or what to omit. 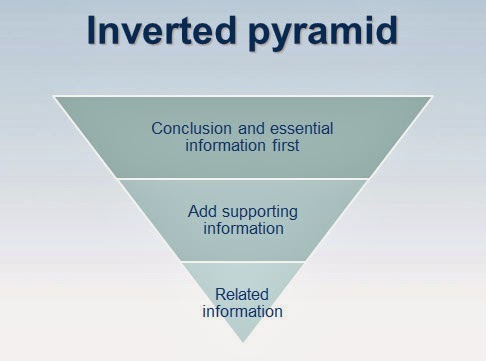 Pyramid inverted style conversations display a summary with the important or essential information first and continues progressively disclosing details of content. This approach let the user decides when to stop reading because he finds sooner the useful information and if he think it is necessary he can continue reading for extra data. They are documents that compile and explain all the information regarding a software product (or suite of products) user interfaces. In general companies include templates, design control and rules, logos, colours, typographies, illustrations and photographies. The main purpose is to have centralised storage for consistency developed in an iterative process and to communicate user experience standards across an organisation. Some important concepts should be kept in mind while creating or updating a styleguide. Keep the audience in mind - Different people inside a company such as developer, designers and business analysts can use these elements. Plan for success - Think in advance what can make your styleguide successful in your organisation. Keep it alive - Styleguides become soon outdate, for that reason they should be produced in way that they can be easily maintained and supported. Define a review process - Define a specific process for reviewing and modifying the styleguide. Think of the platform differences - The different platforms available in the market make us to choose if we support a specific platform or be neutral. If it is neutral in reference to the platforms, will be harder to maintain and bigger the spreading. Socialize the document in your organisation - Promote the use of it throughout all the levels of the organisation. This ensures that everybody knows the existence, understanding and actively use of it. The more, the better. Clearly define mandatory and flexible standards - Ensure supporting new platforms and new creative ideas setting mandatory standards that are also flexible. Make the styleguide as scannable and searchable as possible - Facilitate searching and browsing capabilities that will make easier to find what they are looking for. Visual examples are desired always if possible. Provide real world example - Illustrate with examples from real applications to demonstrate your point. Try to cover as many applications if it is a large organisation with different applications. Everything counts at the moment of enhance the user interaction, so better focus effort on it. For at least four months I've been trying to import the whole Europe in slim mode so it would allow updates. The computer is a Lenovo quad-core with 8GiB of RAM and initially 500GiB of disk. Last time I tried with the disk alone it took like 3 days to import just the data and more than a week passed before I got tired and canceled the index creation. That's the most expensive part of the import, and reading the data and writing the index on a seeking device is slow. So I bought a 256GB SSD and wanted to try again. 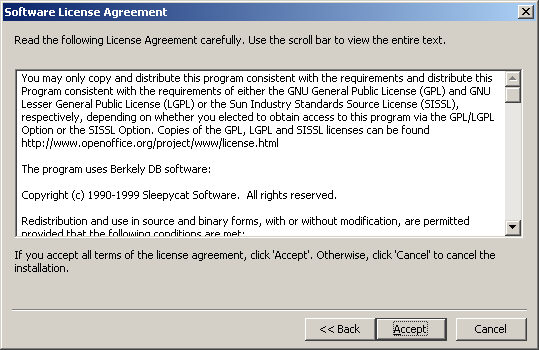 I took 15GiB for the system and the rest to share between my files and postgres, but having the data files on the HDD. At first I tried importing the whole Europe, using 6GiB of cache; remember that my computer has 8GiB of RAM, I though it would fit. It actually didn't and was killed by the OOM killer. I had logs that showed osm2pgsql and the different postgres thread's memory usage, but somehow I lost them. If I find them I'll post them. I lowered the cache to 4GiB but it was still too big and the OOM killer was triggered again. So, around 167GiB of data and around 158GiB of indexes, of which 60GiB and 127GiB are intermediate, respectively. These intermediate tables and indexes are used later during the updates. Clearly I couldn't import the whole planet, but surely Europe should fit in ~210GiB? planet.pbf weights 24063MiB and europe.pbf scales at 12251MiB, so little bit more than 50%. It should fit, but somehow it doesn't. [**] In tablespace 'hdd', which is in the HDD. That's a total of 228517MiB for this partial Europe import, of which 171434MiB are for the intermediate data. It's slightly more than I have to spare in the SSD, so I should cut still more data off if I wanted to import everything in the SSD. Then I tried to render with this, but it was awfully slow. Luckily, when jburgess answered with the sizes, he also suggested to use flat nodes. This is an option for osm2pgsql which uses a special formatted file to store the intermediate data instead of postgres tables. According to the manpage, is faster for the import and the successive updates, and uses only about 16GiB of disk space, which is around a 10% of what my import used for the intermediate data but «[t]his mode is only recommended for full planet imports as it doesn't work well with small extracts.». I tried anyways. So we went from 20h24 down to 13h54 for the whole operation, from 6h40 down to 3h54 for the intermediate data, from 5h57 up to 8h05 for the real data, and a lot less time for the indexing, like a third for each real data table and from 7h15 all the way down to 0 for the intermediate data. So even if the real data processing time went up more than 2h more, the whole import time is only ~68%, uses less space, and it fits in my SSD, with a lot of space to spare. For reference, the file nodes.cache uses only 20608MiB of disk space, which is ~12% of the space used by the intermediate postgres tables. So, now, what about rendering time? This question is not easy to answer. I set up a very rough benchmark, which consists in rendering only one tile for each zoom level in a small town chosen without any particular criteria. Notice how the render time increases exponentially (it looks linear in the graph) between zoom levels 0 and 5, and then the big peaks (up to 720s!) for zoom levels 6 to 8. This is definitely worse than the render times I used to have when I imported several countries, but that data never got to the size of this import. Of course, next weekend I'll fire a full render for the imported region between zoom levels 0 to 14, and then I'll have better numbers to share. Somehow it's trying to use a table that was not created because the intermediate data is in the flat nodes file. I will have to investigate this; I'll try to do it this week. Actually, the disk is sold as '250GB', which is still using the same units as HDDs, so it means that it's only (and the kernel confirms this) 232 GiB. I can't come up for a reason is not 256 GiB, it seems more difficult to fabricate memory in not-power-of-2 sizes. I found that the verb for using duckduckgo for searching the Internet is «duck». I have no idea how many times I join #osm in Freenode just to end up asking OSM question in the #joomla channel. Actually postgres shows the numbers in «human readable sizes», which means that any size above 10240MiB was shown in GiB. I just multiplied those by 1024 to have a rough MiB value. Some day with more time I'll learn how to use the OSM plugin for ikiwiki. Quiper, es una aplicación móvil desarrollada en la empresa donde trabajo, que se llama Quicuo. Su nombre es principalmente una fusión de la palabra Quicuo y Super. Es una aplicación que permite comparar los precios de todo tipo de productos en los supermercados más grandes del país y en principio funciona bastante bien para los que son de Capital y Gran Buenos Aires. La API de consulta está desarrollada sobre node.js, con expressjs como Framework de desarrollo y sequelize como ORM para las consultas a la base de datos. Todo esto es servido a tráves de pm2 como supervisor de procesos en nodejs y con Nginx como WebServer. La extracción que es parte principal del desarrollo está escrita sobre Python, en principio se analizó un Scrappeador profesional pero para los primeros intentos nos pareció un poco complejo así que se optó por hacer un Scrapper propio bien amoldado para nuestro propósito. Por consiguiente, se utilizaron diferentes librerías que son bastante típicas en verdad para esto. BeautifulSoup como parseador de las respuestas HTML para extracción de datos. Mechanize como generador de requests dinamicas y crawler de webs, en principio fue generado todo con Mechanize y luego en algunos casos simples se usó requests una librería con una API mucho más elegante. Además para guardar estos datos de forma más programática se uso SQLObject como ORM en esta etapa. Finalmente el análisis y unión de datos fue escrito en PHP y se usó su conector para MySQL limpio sin ORM. Básicamente los servidores están en Amazon EC2 y por el momento son Dos uno como WebServer para los servicios que corren Nodejs. La Api que consume la app móvil y la Web que todavia no se lanzó. Y otro server que es el más grande y es el de la DB que tiene MySQL y corre periódicamente la extracción y análisis de datos. Un crisol de tecnologías libres que unidas generan una aplicación que funciona y cumple su objetivo, principalmente participaron de este proyecto Dos Desarrolladores(principalmente uno para Phonegap css html y js y otro para el Analisis de datos con PHP), un ProjectLeader, el CEO de Quicuo y un SysAdmin/Desarrollador Python (este soy yo).